It is true that most thieves are only looking for the easy mark. They’ll case the joint, and show up when no one is likely to be home, maybe in the mid-afternoon, for example. In and out in a few minutes, often with no one the wiser. However, statistics show that anyone breaking in at night typically has no issues with injuring or killing the inhabitants of a home in order to cover their tracks. Will there be a forced, violent entry? Most likely. Glass will be broken and doors will be kicked in. However, there is a chance you may not hear it in time. You could be deep asleep during the “witching hours” for these types of invasions, which usually happen between 2 AM - 4 AM. And chances are, your bedroom is located far from wherever the invader’s point of entry is. By the time you are awake and can reach for your firearm, they are in the same room as you, or worse, they have a hostage such as a child, spouse, or other dependent. Firearms enthusiasts are fond of saying “When seconds count, the cops are minutes away…”, only to forget the first part in their home defense setup. Seconds do count. Again, by the time you roust yourself from slumber, the invaders are in the same room as you. A man at a sprint through a house can cover 50 feet in less than ten seconds. So, what to do? You need some form of an alert system to gain some sort of equal footing with the opposition. Home alarm systems have been around for many decades. Actually, ADT is credited with inventing the first one in the 1870s. The user would trip a telegraph relay with a pre-encoded message (I’m guessing on a spool of wire or something) which would alert a local armed response team. It wasn’t perfect, but it worked. Obviously technology has advanced significantly since then. Alarm systems these days incorporate suites of sensors and notifiers of varying levels of sophistication. Realistically, you get what you pay for. Alarm systems range in price from around one hundred to many thousands of dollars. What the feature set includes depends on your budget, needs, and willingness to assume more of the duties of being a first responder. For example, for about $100, you can get a decent starter kit by Fortress off of Amazon. It comes with a bunch of stick-on sensors, some remote controls, a panic button or two, a central control pad, and it makes a helluva lot of racket when it is set off. Systems like this are often modular as well. You can add sensors as needed, and even swap the control pad for a more sophisticated one. However, these low-end systems typically don’t notify an alarm company or the authorities. They make a lot of noise, and it’s up to you to figure things out. Typically, this is the setup I’d recommend for an experienced firearms owner. They typically will not need the police until the action is all over, and are willing to be the tip of the spear for their family’s defense. Even in this setup, it’s always best to have a spouse or other responsible person dialing 911. You grab your gun, and the second person is your backup (preferably armed as well) and is contacting the police. More sophisticated systems, such as those from ADT, will typically include remote monitoring and a response package. The alarm company monitors your system from afar, via broadband or cellular link (or both!) and will contact you in the event of an alarm. Typically these systems are professionally-installed, and at that point you set up procedures like “duress codes”, where a secret codephrase is established for when the alarm company calls, and you are perhaps being held hostage. These systems usually come at a higher cost, or you are roped into a multi-year contract so the alarm company can recoup it’s expenditures. Of course, with these systems, you are still your own first responder, as the procedures involved take time to progress, time you most likely do not have in an emergency. I’d recommend this to more of a novice firearms owner, one who is willing to be “that guy/girl”, but may rest easier knowing that there will be a law enforcement response coming regardless. Alarm systems aren’t the be-all-end-all of the home defense package. In addition to a system, and of course you chosen home-defense firearm, it’s actually quite useful to have a video surveillance system. Some home defense scenarios include barricading yourself or having your loved ones barricade themselves in a secure area. While this is good advice, it can leave you blind as to the situation outside the door and on the property in general. Also, video surveillance can be a handy tool to check on your property while you are away, or for more mundane things as seeing who is at the door. Systems can range from around $100 for a standalone movable (pan-tilt-zoom or PTZ) camera with a built-in webserver for remote viewing, to a full-blown casino-grade suite costing thousands or more. I’ll add a little disclaimer here. My experience with video surveillance is fairly limited at this point, but I can tell you what to avoid to start. The systems to avoid are generally classified as “analog”, “hybrid”, or “AHD” systems. While most of these systems hook into a digital video recorder, the cameras and their connectivity are still analog. The systems are prone to interference from nearby signals and power lines, running their cabling requires great care, and dealing with termination (making sure the cables have proper connectivity) is a mission. And when something breaks, specialized tools are required. Sometimes a seller will try to convince you it’s a newer digital system. And in part, they are. As I said, they consist of analog cameras feeding a digital recorder. It’s akin to having a VHS camcorder send video to be converted to digital format for storage on your computer. The quality is standard-definition at best (maybe with widescreen features if you are lucky), and it’s hard to discern things beyond a few feet. Is that a delivery guy or someone else coming up the driveway? Buyer beware, unscrupulous sellers will often throw the measurement “TVL” around when describing an older hybrid system. TVL means “TV Lines” and is the measurement of the horizontal resolution that the system is capable of. You’ll see a figure like “1000TVL”, and think it’s a new HD system, when in fact the system tops out at 960 x 480 as the recorded resolution. Again, not too great. And I won’t tell you about the dubious fun of terminating BNC connections. Well, it is fun sometimes. However, like everything, the state-of-the-art has advanced. Older hybrid systems have given way to modern fully-digital systems, which almost always transmit their video signals over standard Category 5 or 6 network cabling, or wirelessly. Usually, they also send power down one of the wire pairs (Category 5 and 6 cables have 4 pairs of wires in them…) so you can send and receive signal, and send power all in one cable. Network cable is usually much more robust, and far cheaper to find and replace if needed. Brands I can recommend are Lorex and Q See. Note that Q See still sells analog systems - check the descriptions before you order. The bonus of a digital or IP system is that self-installation is a snap. If you can configure your home computer network, you can configure an IP-based video surveillance system. Remote monitoring is a breeze, with slick web interfaces and companion mobile apps being the norm. A basic setup will run you around $500, with the costs generally going up as storage and the amount of cameras increases. Standard video resolution is 1080p, with the newest systems sporting 4K cameras with full pan-tilt-zoom motion, and (infrared lamp-assisted) night vision. Other solutions exist, such as the Canary which is a pretty slick all-in-one camera/security solution. Each Canary unit includes a 1080p video camera, a motion-detection system with an audible alarm, air quality and temperature monitoring, and the ability to notify emergency services based on specific parameters. There’s also a highly-polished companion app for the system for both iOS and Android. Canary also offers a weatherproof outdoor version called the Flex, which runs completely wirelessly, with the catch that it does need to be dismounted and plugged in occasionally to get a charge. This sophistication comes at a price though, with each Canary costing around $200, which adds up, since the Canary is stationary and can only monitor one room or area of your home at a time. However, as with any new tech, I imagine the cost of what the Canary offers will come down, and it’s technology will find it’s way into competing devices. Alarms and video surveillance systems make our home defense tasks easier. Each of these solutions can be integrated into your overall home defense plan of detection/assessment (is it a break-in or Grandpa up at 3 AM looking for for some Gas-X? ), physical security such as break-resistant windows and deadbolt locks, response, cover & concealment for vulnerable residents, notification of authorities, and evidence collection. However, all these parts of the plan come with their own failure points and issues. Alarms and video systems fail or don’t work during a blackout (or something crazy like an EMP attack, ha ha…), your firearm may jam at an inopportune moment, or the authorities may just not show up. Practice, rehearse, and be ready for anything. Learn how to do without parts of the plan, and have backups where possible. Have a fallback “alarm” like a dog, have another gun ready to go and a partner backing you up with it if the first one fails, that sort of thing. At the end of the day, you are your own first responder. 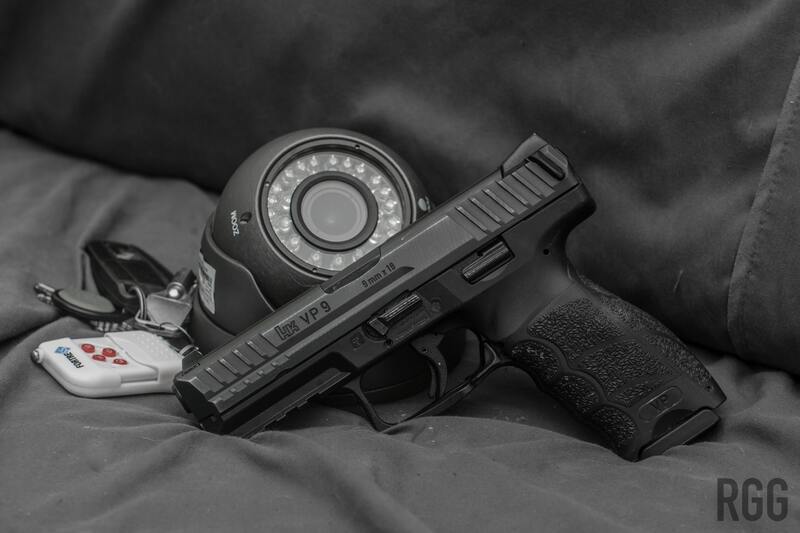 If you want to see a rundown of home security system options, check out my guest posting over at Science of Skill, one of the leading blogs in the world about self-defense and self-reliance.